The church is the people not the building – but you knew that, right? I find this very odd. I understand the discussions and debate about changing the way schooling works because a lot of it was designed to meet the needs of the Industrial Revolution (check out this brilliant video about this). However, when it comes to church buildings, they themselves haven’t changed much at all in the last 1000 years and more. A church building is required for a gathering. It needs to be a space that a group of people can come together. The Greek word for Church is Ekklesia, the same word that was used to describe the Greek parliament – it just means gathering or meeting. School assembly halls haven’t changed, they are still a big room large enough for the students to gather. You can’t compare Church with work or school – Church is somewhere we go on a Sunday, work and school are what we do for the rest of the week (where we act out what it means to be church in the world). If Church starts to look like my workplace then I don’t want to go there any more! I’m all up for moving things around in church buildings and having services that are in different styles – some that are formal when we all face forwards and some where we might sit in groups. But I wouldn’t want to get rid of our beautiful ancient churches just to fit in with a new trend. Something that’s amazing about Christianity is that sense of continuity we have with the past. Our Christian heritage in the UK goes back centuries and that’s something I take great pride and comfort in. I think the issue is less about the buildings themselves and more about what we do in them. I wrote last year about the need to have more participation in church – but that’s not about the pews it’s about the people and their attitude. 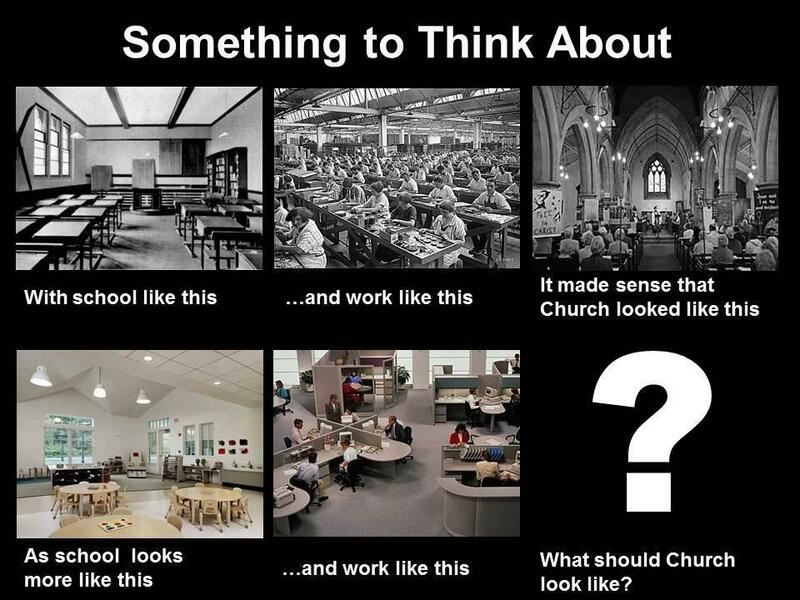 So I think this picture kind of misses the point and focuses again on the idea of the church being the building and not the people. Totally agree that the church is not the building; something I’ve believed for years (my local church has no building and never has). That said, I think we should take this image at more than face value and not simply as a limited suggestion to reorganise the church’s seating into café style tables. I took it as a completely open invitation to envision whatever “church” should look like. And, talking of traditional thinking…church for me is not somewhere I go on a Sunday; I think that is another traditional model of thought from which we have to break out. Both in the literal sense – meeting at predictable times on a Sunday morning is not relevant to a huge number of people today; and in the sense that church is traditionally viewed as a separate part of our lives from the remainder (work, education, leisure). I believe we need to break away from both of those prejudices. As always, no theological background, just my 2 cents in good faith; excuse the pun. thanks for commenting. You’re quite right that church isn’t *just* somewhere we go on a Sunday – I tried to qualify that statement with the fact that when we leave we go and are church wherever we are. I think this image just looked like it was about buildings and spaces rather than being about what we do in them. I think it is worth discussing how church should look and which things we do unthinkingly because we’ve ‘always done that’. At the same time though, I do think the Church is a very different thing from school and work and part of its beauty is its tradition – which I would never want to lose. As I said, although I thought the image was overly simplistic it has made me think and also have this discussion with you so it’s not all bad! A good conversation starter! I once asked a question at a Friday evening dialog, that if our church. where to meet on another day other then Sunday. The Sunday routine is some how embedded in the mind that Sunday is the only day a christain should have church meetings and almost seems like a legal requirement. The apostical alignment currently addresses many false practices and reintroduces sound and accurate teaching of what is true and correct.